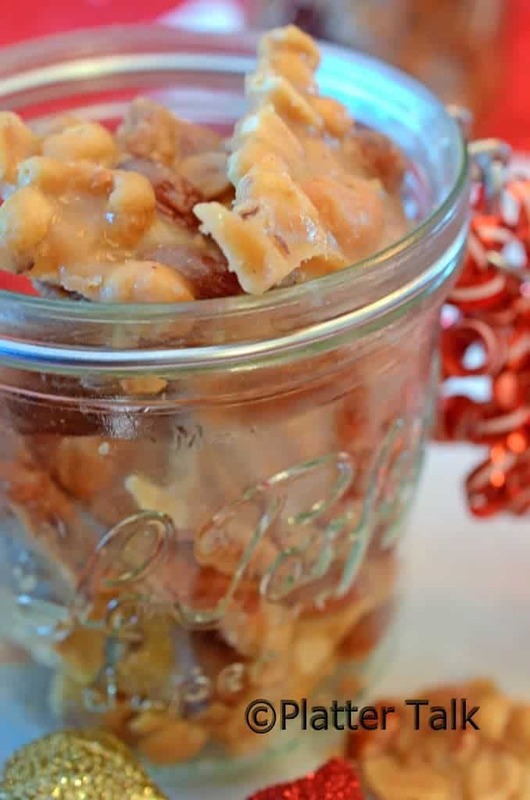 How Do You Make Peanut Brittle? See the Delicious Answer Here. 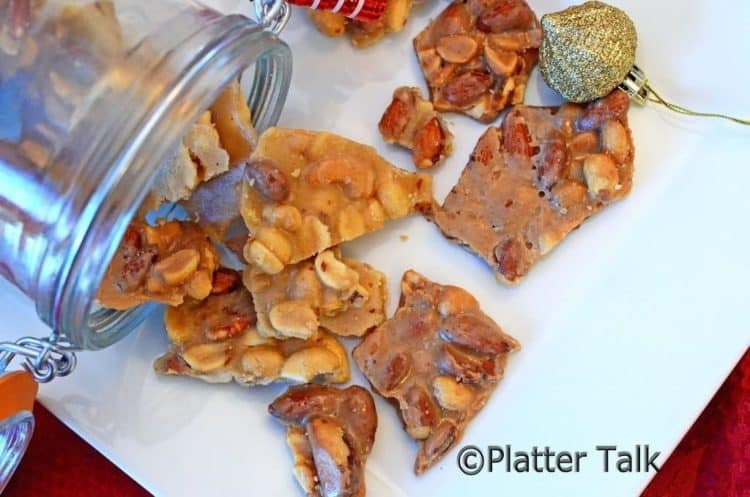 If you have ever asked, “How do you make peanut brittle?” then this a recipe that you’re going to want to read and then make. Last week I walked into our office at work and found the usual array of papers scattered about. Some notes about vacation requests, a memo from the pharmacy, and some literature from a vendor that had dropped by the day before. Visually, that was all like white-noise to me, what really caught my attention was scattered atop a serving platter. Once again, my friend and colleague Lane had been up to something delicious – this time with help of his mom who was visiting from Wyoming. 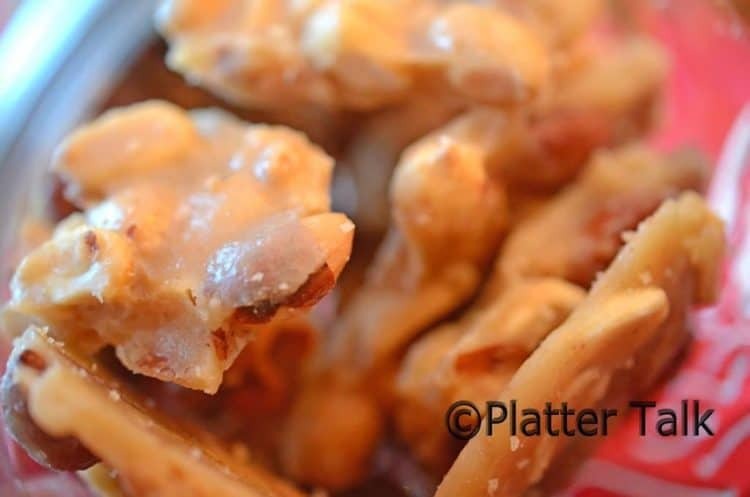 How Do You Make Peanut Brittle? Like the work place of many, mine is a challenging one to be around, with the vast amount and variety of good eats that always seems to make its way through the doors. At no time is this more evident than around the holidays. One of the major contributing factors to the ever-present food at my work locale is the number of excellent cooks and bakers with whom I work. Throw in a visiting family member or two and the phenomenon seems to become even more expansive. When Lane mentioned that he was making a treat for us and his mom Nancy was helping him put it together, I had a feeling that it wold be something pretty special. Lane’s folks visit several times a year and over the past 12 months or so we have become both well acqainted and quite fond of them. Both Dale and Nancy, Lane’s folks, have both laid their claim to fame with signature dishes and we have been privileged to have been served Nancy’s Chicken Parisienne and Dale’s Chile Relleno. I hope to get both of them do a guest post, here on Platter Talk, at some point in the near future – which of course will afford me yet another opportunity to enjoy their culinary prowess. 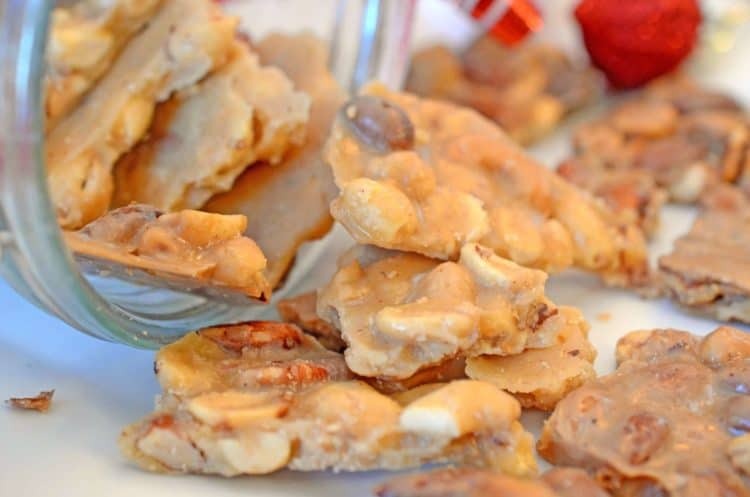 This Cayenne Toffee that Lane and his mom put together is a peanut brittle of gourmet caliber. The cayenne lends an element of zip that when paired with the sweet base and crunchy array of mix nuts, leaves you with just one direction in which to go after your first piece – back for another. And another, and then just one more. I’m not going to deny it, this stuff is dangerously delicious and in my opinion carries a high potential for addiction. What more could you ask for from a treat that is tailor-made for the holiday season? Thanks to Nancy Groutage who made this for us, sometime after I asked, "How do you make peanut brittle?" In heavy sauce pan, melt butter over medium heat. Add sugars, syrup, and cayenne pepper and mix together until sugars are dissolved. Increase heat and bring mixture to boil and turns a golden brown in color. Place mixture on cookie sheet and allow to cool and harden. Break into pieces, using your hands. For more zip, add an additional 1/2 teaspoon of cayenne pepper. Wow these are amazing for snacking. Recipe sounds really delicious. 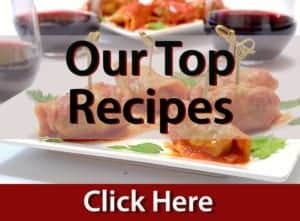 I’m a huge PB fan and I really love how you added a bit of cayenne into recipe. Soooo good. 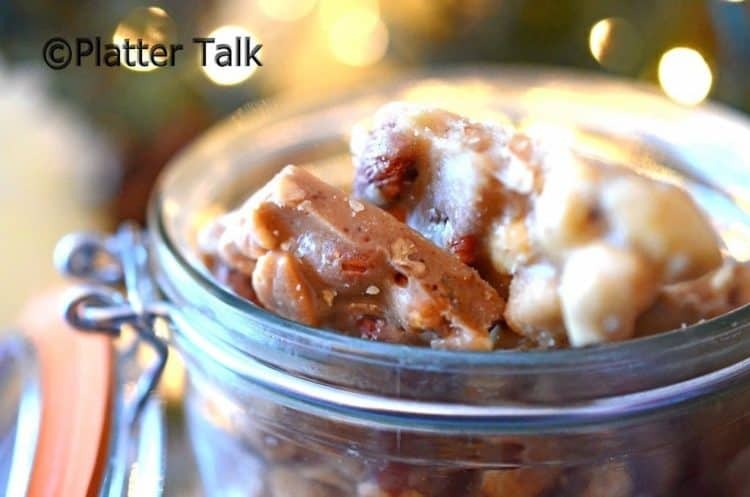 Your brittle looks delicious! They are such a holiday classic. I don’t always get to make it but they are perfect take-home gift for guests! 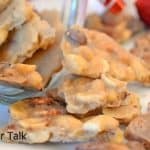 I love peanut brittle but have never attempted to make it! I love the little kick of spice in this recipe – totally my kinda flavors! The addition of cayenne sounds fantastic in this. Sweet and spicy is such a great mix! Well, I think I recall a few times I had peanut brittle at my friends’ houses but I don’t think I have ever tried making at home. 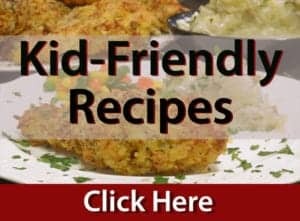 This looks like a great and easy recipe to try! 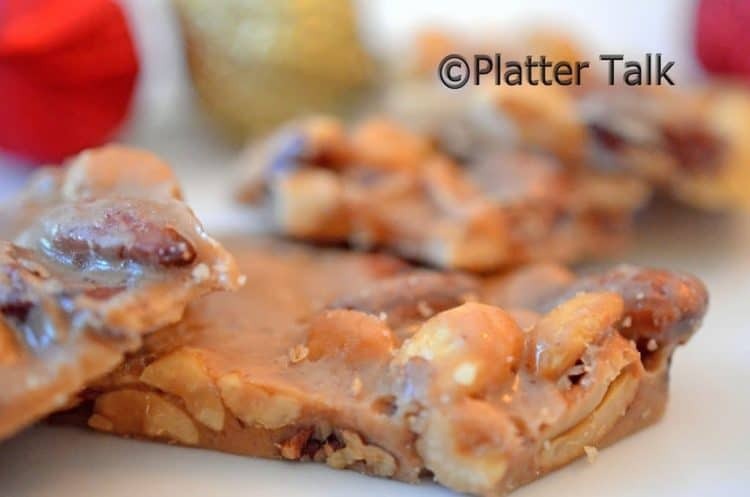 I looooooove peanut brittle, but have never had success with making it…I am going to try your version and see if I can finally conquer the brittle!! Mmmm what a great snack. I like the simple list of ingredients. This is perfect for me. I am sure that my family will be delighted with your recipe. Looks very tasty. Thanks. OH, Peanut butter brittle. I have not seen these in forever!! my grandmom use to make peanut butter brittle. Love the cayenne twist in these. Sounds yum.